Dr. Sheryl Handler, a pediatric orthopedic surgeon at Akron (Ohio) Children's Hospital, has faced subtle sexism throughout her 16-year career. For instance, even though it's not permitted, Handler recalled being asked during her fellowship interview in the early 2000s if she could handle the workload because she had a 3-year-old child. Additionally, during residency training, she remembered she took heat from a male colleague who took extra on-call shifts while she was away on maternity leave. Handler said she had taken extra shifts before her leave to make up for her time away. And Handler said parents are still sometimes surprised that she's the one performing their child's procedure. They assume she's a nurse. Sometimes parents will even call her “sweetie,” or by her first name. “You wouldn't call a male doctor by his first name,” she said. Dr. Sheryl Handler is a pediatric orthopedic surgeon at Akron Children's Hospital. Still, Handler considers herself lucky. She's heard from her female colleagues in orthopedics who have it much worse. They share stories of harassment, bullying or sexual assault from male colleagues and superiors. Those in the field say Handler's experiences are commonplace for women who enter surgery. A pervasive culture of sexism and stereotypes keeps women away from the field. Women in other male-dominated specialties like cardiology shared similar experiences with Modern Healthcare. But it's in orthopedic surgery, the surgery specialty with the least number of women, where the differences are most stark. Women make up just 5% of the active physicians in orthopedic surgery, according to a 2015 report from the Association of American Medical Colleges. The percentage is likely to rise, but only marginally, with data showing that about 14% of orthopedic residents are women. Those low numbers mean that women have less opportunity to make a big impact on patient care and increase the wage gap between male and female doctors. Women orthopedic surgeons on average made $40,953 less than their male counterparts, according to a 2016 JAMA Internal Medicine study. And although hospitals and health system leaders have overwhelmingly embraced the importance of diversity in the workforce, female surgeons still represent a small percentage of leadership positions at hospitals—the second-largest employer of surgeons after physician practices—and medical schools. For example, female orthopedic surgeons account for only 8% of full-time orthopedic faculty positions at academic institutions. Further, the sparse number of women in orthopedics and other competitive surgical specialties persists even as more women than men are enrolled in medical school. The statistics show women are drawn to other specialties like obstetrics-gynecology and pediatrics, where they make up more than 50% of the physician pool, and the pay is much lower than it is in purely surgical specialties. A number of reasons deter women from entering orthopedics, but perhaps chief among them is the fact that women don't see anyone who looks like them practicing, a state of affairs that feeds upon itself. “I think if you have a female student excited about a field, and they don't see other people like themselves doing it, they may be concerned about why women aren't doing this,” said Dr. Dawn LaPorte, a professor of orthopedic surgery at Johns Hopkins School of Medicine. A 2015 survey of female orthopedic physicians and residents co-authored by LaPorte found only 17% were exposed to the specialty in medical school. Medical schools still largely prioritize teaching students common conditions like renal or heart diseases rather than orthopedics. That puts patients at a disadvantage, LaPorte said, given the looming wave of aging baby boomers and people wanting to be active longer. And even if a woman does choose orthopedics, she likely will be turned off from programs and practices with no women, so the cycle continues, added Dr. Ann Van Heest, director of the residency program for orthopedic surgery at the University of Minnesota. In fact, there are still orthopedic residency programs in the U.S. with no women. “It's hard to get the first woman in, and be the only woman in the program,” she said. Women also might find that other specialties with a greater percentage of female employees provide things like lactation rooms or flexible education schedules. Residency usually occurs around the time women get married and have children, so specialties that support work-life balance are appealing. But even for the women who overcome these barriers and become orthopedic surgeons, data show they are likely going to earn less than their male colleagues and won't advance to leadership positions. That's because most hospitals don't make the changes required to stop the trend, said Christy Harris Lemak, chair of the department of health services administration at the University of Alabama at Birmingham. “You have to go beyond just saying it's a priority and you have to start measuring things, and you have to see if you actually got there,” she said. Michigan Medicine is one of few institutions that has addressed pay inequity. Physician faculty members are paid a salary based on nationally competitive pay for their specialty. Further, all faculty members for that specialty are paid the same depending on their position as an assistant, associate or full professor. Uniform raises are given to staff annually. Dr. Michael Mulholland, chair of the department of surgery at Michigan, said because compensation isn't an “issue of contention,” physicians are able to “use the energy for better purposes” like creative solutions and research. The majority of hospitals don't pay doctors the way Michigan Medicine does. Instead, most are compensated based on services provided. Mulholland said this structure enables the pay gap because there is room for variability. Pay inequities “can develop for millions of reasons, and they (hospitals) are likely just not paying attention or being mindful about what they are trying to achieve,” he said. But compensation can be fair in the traditional pay structure, too. In the surgery department at the University of Alabama at Birmingham, which uses productivity and accomplishments to determine pay, a new compensation model resulted in a reduction—although not total elimination—of the pay gap. The model, which went into effect in January 2017, continues to compensate surgeons based on services but withholds 12.5% of that pay. For the amount withheld, 10% is divided and paid back to surgeons meeting productivity targets and the remaining 2.5% can be used to give incentives for academic activity or other projects. The changes resulted in a significant rise in salary for female surgeons and decreased the pay gap. “If you make pay equitable and transparent, it has the capability to fix any gaps in pay based on gender, based on race,” said Dr. Herbert Chen, chairman of the department of surgery at UAB. Chen said he's seen increased interest from other institutions in developing similar compensation models. Michigan Medicine also created a program last year called Michigan Promise to recruit and retain more women and minority surgeons. Leadership development is part of the effort as well. During the hiring process, a panel of 15 faculty members of different genders and races interviews with candidates. “It's a nice way to make sure that everyone gets a fair shake,” said Dr. Dana Telem, an associate professor of general surgery at Michigan Medicine who helped develop the program. Michigan Medicine has also implemented leadership development programs, limited meetings after 5 p.m. and mandated departmentwide gender bias and awareness training. Telem said benchmarks include how many women and minority surgeons are hired and promoted to leadership positions in the next few years. Lemak, who worked at Michigan Medicine, said the institution “is an outlier” in terms of how intentional and deliberately they're addressing the issue. Similar to hospitals, specialty societies are also in the beginning stages of addressing diversity. 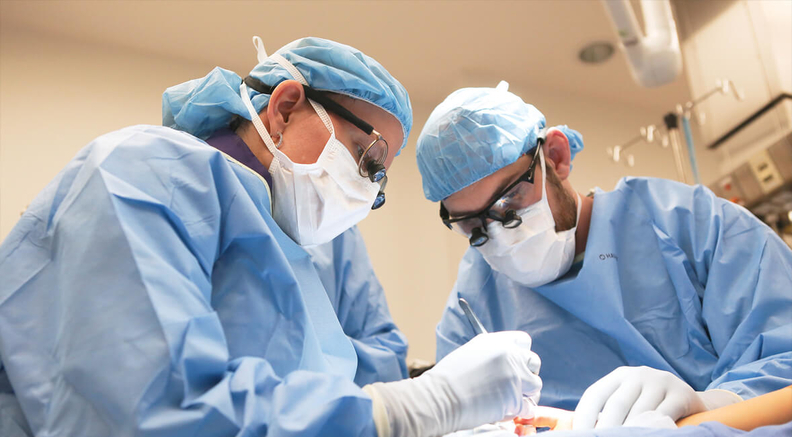 The American Board of Orthopaedic Surgery made changes recently to some of its policies to entice more women to join the specialty. For example, the board previously required 46 weeks of classes each year during a five-year residency. Beginning this year, the board now allows residents to complete an average of 46 weeks of education per year. “That allows someone to take family leave, so they can start a family,” said Dr. David Martin, executive medical director of the board. Additionally, the nine-hour board certification exam was modified in 2017 so breastfeeding mothers can have an additional break to pump. “While those may seem like small changes, when medical students are looking at careers, that can make a big difference,” he said. The American Academy of Orthopedic Surgeons, which represents 39,000 members worldwide, has a diversity advisory board working to increase the number of women and minorities in the profession. The board is currently researching the challenges women and minority surgeons face in their workplace and plans to create an action plan to address those challenges, said Michigan's Van Heest, chair of the organization's diversity board. She is also looking for best practices of diverse residency programs to share with others what works. But Yale New Haven's O'Connor, who was previously chair of the diversity board at the American Academy of Orthopedic Surgeons, questions the effectiveness of such efforts given the limited investments made. “The problem is that people talk about diversity, but allocating the resources to move the needle is where the challenges come in,” she said. The AAOS declined to disclose its budget for the diversity board. The Ruth Jackson Orthopaedic Society, a national organization for women in orthopedics, provides mentorship, leadership training and networking for about 600 female orthopedic surgeons in the U.S. and internationally. LaPorte of Johns Hopkins serves as secretary of the organization, which is named after the first board-certified female orthopedic surgeon in the U.S.
O'Connor said larger efforts to attract women likely haven't happened because orthopedics is a competitive specialty. “When you are still getting enough of the best and the brightest from the male cohort, the (negative) impact isn't really there,” she said. “But one of the challenges is that people don't always remember the value of diversity in the profession. When we have a more diverse workforce, we will counter bias in our processes in the way we deliver care,” she said. Correction: Dr. Ann Van Heest is director of the residency program for orthopedic surgery at the University of Minnesota. An earlier version of this story misstated the name of her employer.